Publisher's Summary: Two days before the start of her junior year, seventeen-year-old Janelle Tenner is hit by a pickup truck and killed—as in blinding light, scenes of her life flashing before her, and then nothing. Except the next thing she knows, she's opening her eyes to find Ben Michaels, a loner from her high school whom Janelle has never talked to, leaning over her. And even though it isn't possible, she knows—with every fiber of her being—that Ben has somehow brought her back to life. My Take: This book was freakin’ SICK!!! From the very first page until the very last, Unraveling was utterly epic! And even though I loved the book from the very start, I think the last 30 pages took the cake! So, do you think I liked this one? Yep, you got that right! I absolutely loved it, and I think this is truly a new fave of mine. There are so many reasons why I thought this book was amazing, but I do have to say one of the biggest reasons is that this book consistently kept shocking me in so many different ways. And I would NEVER have guessed that the book would take the direction it did in the end! Did I tell you how awesome it was? Oh yeah, I already did. The first shock comes only moments into the story when the protagonist, Janelle, suddenly and horribly gets hit by some random truck . . . and DIES! But, mysteriously, she is brought back to life and not by the Paramedic/CPR kind of way! More like by some crazy science fiction type of way, by a loner/stoner kid from school named Ben Michaels who Janelle never really “noticed” before. Janelle knows that no one will ever believe that she was ever really dead and then brought back to life so the only person she tells is her best friend and he just brushes it off. But the one thing Janelle’s BFF, Alex, actually does believe is that there’s something really, really strange about the guy who hit her! Not only is the guy freakin’ strange, but his truck is even stranger! And all of this opens a huge can of mystery that Janelle and Alex are obsessed with solving, even if it means getting caught snooping into Janelle’s dad’s FBI files (Janelle’s dad is in the FBI). And to top it all off, during Janelle and Alex’s snooping and ear hustling they suddenly realize there’s an even more mysterious countdown to some other equally mysterious who-knows-what. Even if no one knows what the countdown will lead to, the countdown clock plays a huge role in this book. In fact, each chapter is titled with the time remaining on the countdown clock. I loved following that dang clock. Oh, my, GOSH! I effin’ love Ben Michaels! There is just one thing after another that keeps me falling harder and harder for that boy! I effin’ love you Ben Michaels! 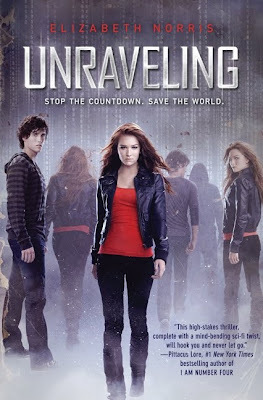 And you will totally get why I’m saying that when you read Unraveling. But I do effin’ love Ben Michaels! Dang it! Just thinking about him gives me the butterflies in my tummy and I start grinning like a love sick puppy. Another thing I loved about this book was how the story developed. Not only are we following this countdown (sometimes minute-by-minute and other times hour-by-hour), but we are also following flashbacks from the past, from Janelle’s memory. I can’t think of another author that developed a character’s past better, and with such amazing intricacy, as has Elizabeth Norris did with Janelle. Elizabeth surreptitiously weaves a phenomenal story about why Janelle doesn’t have a relationship with her ex-best friend anymore, why Janelle doesn’t remotely care about dating a guy only days after the guy broke up with his girlfriend or why Janelle is pretty much her little brother’s only mother. Oh, I forgot to mention that about midway through the book, there was this really sad part that had me crying for at least 30, maybe even 40 pages. And by the time I was done with all the emotional rollercoasters...toward the end of the book I was so drained of emotion that I was literally numb…and then comes that epic ending…and then I was reeling all over again! OK…so enough about my rambling on and on about this book because I think I could go on FOREVER! So if you have a copy to read, read it now…and if you don’t, preorder it now because this is a book that I want EVERYONE to read. It’s really THAT good! Wow, great review, Mindy! You've made me feel excited for book I hadn't even heard about before. I'm putting this one on my to-read list. Sounds like a rockin' good time! So THIS is the book I've been seeing you race about. I hadn't even noticed it until the past week or so. It dies sound very interesting. And I guess you "effin love Ben Michaels" so he must be pretty great. I will definitely read this when I get a chance. Fun review! Awesome review!! It makes me want to read this book even more than I already did. It sounds really fantastic!! Janelle sounds like a really awesome and well developed character too. Thanks for the fab review hon!! Your review makes me want to go read this now, now I have another book to be excited for in April. I can't believe this book was no where on my radar it sounds amazing. Wow, great review! I'm glad the book is good 'coz I've already preordered it! Can't wait for it to be released! Wow, this books sounds great! Love your review. I'm very intrigued by the clock countdown you describe -- sounds very unique! Thanks for sharing! This will definitely go on the TBR list. Well you've convinced me! I had the chance to review it but didn't take it. Shoot cause now I'm dying to!